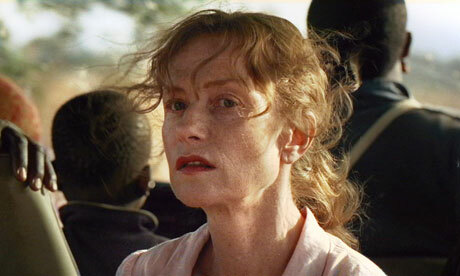 Giving the film no historical context is a bit frustrating, but Denis, who has her own tenuous ties to the continent, seems to indicate this could be “Anywhere Africa” and what she displays — the ailing after effects of colonialism, the brutality of civil wars, the inhumanity of using children as soldiers, and the rampant anarchy of a land full of “hot air” is a hellish portrait of her former home. Anarchy — of the mind, of a nation, of a land — is the running theme of the film. Denis begins the film near the end, and she inter-splices scenes that don’t make much sense until things come full circle. Yet there is no conclusion, no pay off, simply an endless loop of suffering and madness we are made to not endure, but simply witness. Similar to a Michael Haneke film, Denis does not always lay the motives of her characters out to bear (Huppert’s stubborn Marie seems to want to stay because she can’t show courage like this in France), nor (as seen in the lack of a historical context) does she care much about spoon-feeding a back story to her audience. This can make it hard to connect with the characters and leaves a sense of vague foreboding hanging over the proceedings. Sometimes I wished for a deeper connection to something. But the richness of the film can be found in the immaculate mise-en-scence, the authenticity of the surroundings and the layered details found in the set designs and location shoots. There’s also an atmospheric music score from Denis’ regular collaborator, Tindersticks, that sets a mood of unease and helps key scenes stick in your throat. One eerily near silent scene, where soldiers bring about the demise of a sleeping brood of young rebels lost in dreams amongst the comfort of “white material” in Marie’s house, is a chilling depiction of the casual nature of evil. Yet at the center of the film, holding everything in is Isabelle Huppert as Marie. Her lazy and idiotic son has lost him mind, her dubious “husband” has been leading another life married to a native and trying to make shady deals with the local government, and the patriarch of the family is sick and dying and useless. She takes on the role of a martyr and a universal “white mother” and she hangs on her bony frame unglamorous “white material” trying to foolishly prove to the land that she can survive it…she can rule it. Huppert is all quiet tension and discontent, and there’s a bitter familiarity to watching her crumble to tears and then resort to violence in the end. She’s destined, it seems, to be weak and caught up in the endless cycle of misery. Claire Denis’ White Material is only for those with the patience to suffer through such a cinematic provocation. There’s plenty to chew on, but few will enjoy the meal, and all will feel a little starved in the end. This entry was posted in Art-house Cinema, Movie Reviews, Movies and tagged Africa, Anarchy, Child Soldiers, Civil War, Claire Denis, Coffee, Colonialism, Foreign Films, French Films, Isabelle Huppert, Tindersticks, White Material. I thought the movie was masterful, a chilling exercise in politics that is the total reverse from her last film. Huppert is just magnificent in the role, her best since The Piano Teacher. Denis has an incredibly ability to make the intangible reachable (as in The Intruder) and the concrete and common into something poetic (as she does here, turning a didactic screed into something more evocative). I’ve been binging on her lately and have been overwhelmed each time. Undeniable Side Note: Inexplicably, The Ritz at the Bourse in Philly had the most hilarious film trailer I have seen in quite some time play in front of White Material. Boy David, I pretty much agree with your assessment. I saw this earlier in the week and I walked away conflicted. I liked the look of the movie, Huppert’s performance, and many scenes in the first half of the picture. But the movie always came to a screeching halt for me when her son comes on screen and his descent into insanity made little sense to me. Like you say, there is little to no backstory; we have to piece that together ourselves. That isn’t necessarily a fault, but with the son I think I needed more. OK, he was a spoiled brat, but there had to be more to him. And the end seemed tacked on, an inorganic device so Denis could give the story closure. The only reason she did what she did works symbolically, a miserable way to construct a movie. Like Chantal Ackerman’s JEANNE DIELMAN, both are strangely hypnotic (we know we shouldn’t like what we’re watching), but the final acts of violence make little sense (more so in Ackerman’s film). All in all, I have reservations, but I still liked a lot of it. I was going to write a review, but you echo many of my thoughts on it so I won’t bother. I’ll spend my time on BLACK SWAN instead. Oh, and I actually went and saw RARE EXPORTS yesterday. It is surprisingly hilarious. I spent the entire movie grinning ear to ear. The trailer looks cheesy, but it’s good fun, well worth checking out when it opens in Philadelphia. Yes BLACK SWAN is either a love or hate movie and I think I know why. I’ll post my thoughts in a couple of days. I will be interested to hear what you think though. I know you’ve been looking forward to it. And I am on the ‘hate’ side with this one, though it’s painful in view of my past love for Aronofsky. Well David, I am with Jake Cole with this one, and indeed with every Denis I’ve watched. I awarded it five stars and consider it one of the best films of the year. By deliberatly refusing to reveal her setting Denis disavows political context to focus instead on human nature and the inherent evils that lie in all societies with the equivalent of colonial intrusions. The film slowing built up narrative power and thus reached the viewer quite powerfully on an emotional level, and as everyone on this thread seems to agree Hupert is compelling. For me she stands with Mezzogiorno, Swinton and perhaps Portman among the year’s best lead actresses. AS always you’ve defended your position with penetrating authority.